February basking continued being positive in spite of 8 straight days of no turtle appearances mid-month (2/9-2/16) presumably due, at least in part, to the enormous swells and horrible weather our state experienced during that period. Even so, as we’ve come to expect, basking began to noticeably pick up in the last half of the month with 19 basking occurrences in 4 days from February 20ththrough the 23rd. There were 37 total basking occurrences during the month compared to 33 last year and 34 the year before. The February 2019 total was the most we’ve had since February 2014 when 54 appearances were made on the beach. Our total basking for the year is 17 more than last year! 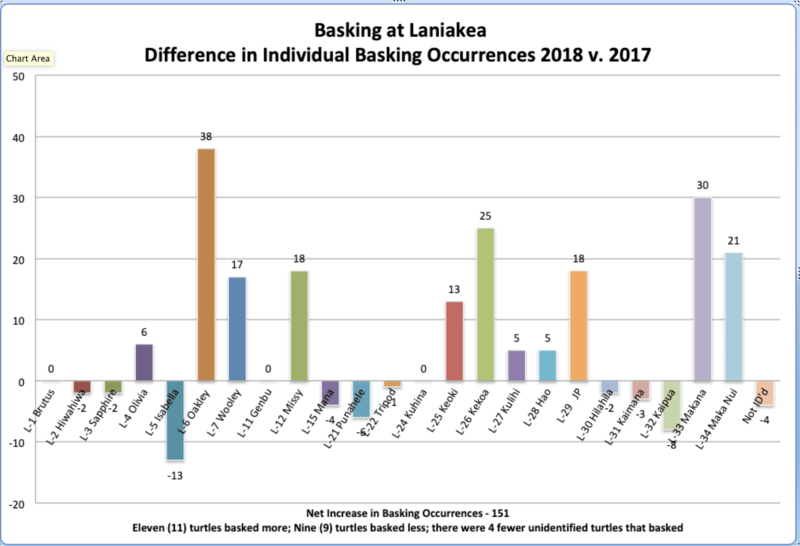 The number of different turtles basking each month in 2018 was generally higher than 2017, and that trend is continuing so far into 2019. During February there were 12 different named turtles that hauled out onto the beach to bask. Last February there were only 9 and the year before only 7. 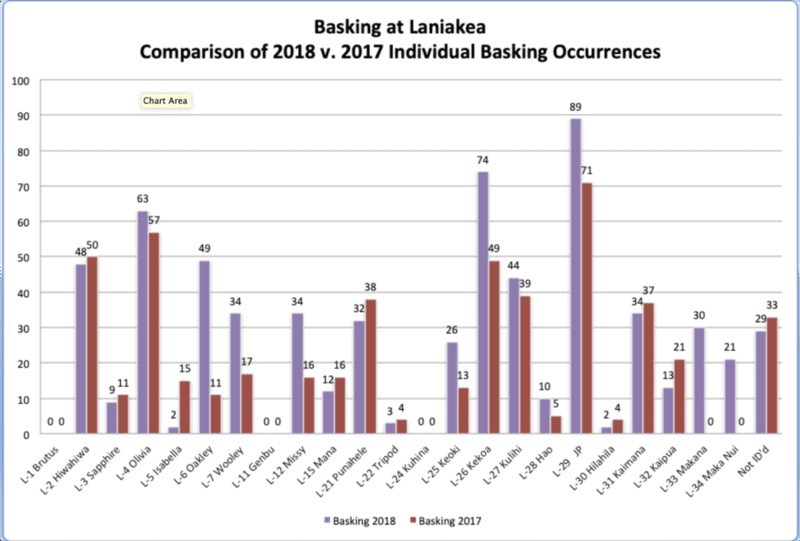 In fact, it is important to note that this was the largest number of different turtles basking in January since 2014 (when there were also 12)! The last time there were more than 12 different turtles on the beach in February was way back in 2011 when there were 14 (and this group included Brutus, Scallop, Kuhina and Kaheka, all on hiatus from the beach for 3 years or more). Our “top three” baskers for February were Kekoa with 7 appearances, JP with 5 and Olivia-Dawn with 4. February suffered 11 days without a turtle on the beach, up from the 7 such days experienced during the prior year but remember, there were also “special” circumstances this year and we still ended up with more basking occurrences this year. February had multiple turtles only 8 different times but there were 7 different honu out on February 23rd! Of our 20 “active” turtles, more than half (12) hauled out in February. Only Oakley and Missy from the “top ten” failed to appear. Hiwahiwa, Olivia-Dawn, Keoki, Kekoa, Kulihi, JP, Maka Nui Mana, Punahele, Wooley-Bully, Makana & Kaimana graced our shore with their presence. On the Ides of March, 1999, a solitary male green sea turtle hauled himself out of the ocean at Laniakea Beach to bask in the sun. Later named Brutus by Malama na Honu, he is part of the vanguard of a relatively small number of sea turtles that, for reasons yet to positively be determined, come out onto dry land to rest and get warm. Individuals from no other species of sea turtle or any of the other 10 “discrete population segments” of green turtles (Chelonia mydas), engage in this activity in the same way it happens in Hawaii. These turtles crawl out of the water of their own volition. Turtles in a couple other places sometimes find themselves washed up onto shore by wave action and stay on dry land for a period of time before returning to the water, but apparently nowhere else do male and female adults, as well as subadult and juvenile turtles purposely exit the water because they themselves have decided to do so. The sight is incredible! Over the ensuing years, more green turtles (Honu in Hawaiian) have found their way to this and many other beaches in Hawaii. Their presence on these beaches has become a legitimate tourist attraction. At Laniakea alone, over a half million people come to the beach to view these turtles basking each year. This puts the turtles in jeopardy of being harassed and tormented by unthinking humans. Oakley (m), Wooley-Bully (m), Mahina (f) and Squirt (m)). By 2005, the Laniakea family (`ohana in Hawaiian) had added 7 more (Genbu (m), Missy (f), Mana (f), Pukalani (f), Scallop (m), Honey Girl (f) and Tripod (m)). At that point there were 16 in all coming out. For 9 years, the `ohana at Laniakea had grown steadily but 2008 saw tragedy strike. Pukalani was apparently taken by a tiger shark at the nesting grounds at the French Frigate Shoals in the Northwest Hawaiian Islands and humans maliciously butchered Honey Girl as she peacefully basked overnight on the beach. Although Laniakea lost 2 turtles in 2008, Kaheka, a subadult, was added to the rolls to bring the basking total to18. 2009 saw one new turtle choose the rocky shelf area at the southwest portion of the beach to begin basking. It was large enough to be an adult female so it was named ”Clawdette” for the claw shaped bite apparently taken out of the left rear flipper by a tiger shark. Clawdette though, was large for “her” age and a late ”bloomer.” After disappearing from the beach for over a year at the end of 2012, this turtle returned in March of 2014 with a long thick tail! The honu was quickly renamed Keoki (George in Hawaiian). In 2010, 3 new turtles began their tenure at Laniakea, Kekoa (sub), Kulihi (m) and Hao`okanaka (sub). Hao`okanaka was originally named “Ironman” for famous surfer Andy Irons who tragically died that year. When it was discovered that the turtle was a female, the name was shortened to ”Hao” or “iron” to preserve the honoring but make it gender neutral. At the end of 2010, the `ohana was at its most populous point with 22 actively basking honu. Beginning in 2011 the population began to thin out. 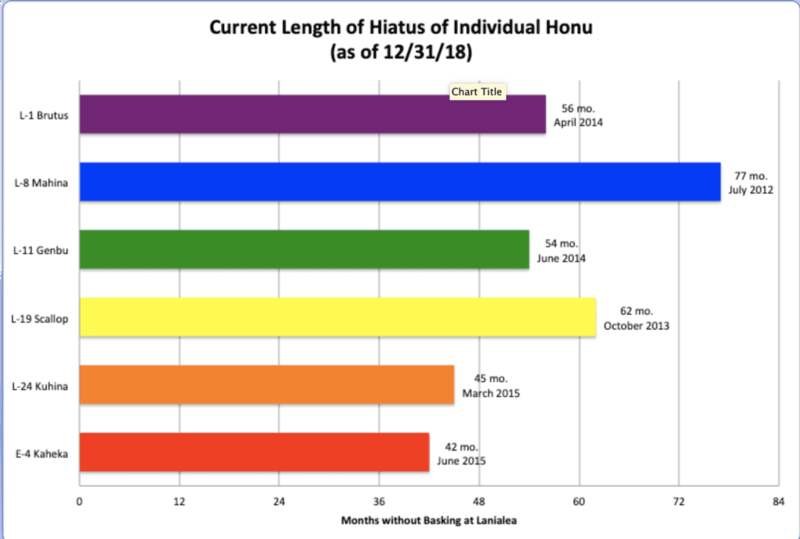 This year saw 2 turtles leave Laniakea to bask elsewhere (Nohea Kamakana and Squirt…though Squirt stopped by for 20 minutes, we assume by mistake, in January 2014). Mahina appeared for the last time in July 2012, Scallop in November 2013 (after being treated by a NOAA veterinarian for severe injuries from a boat strike), Brutus in April 2014 (which really affected our overall basking numbers because he had basked with extraordinary frequency—sometimes 24-25 days a month), Genbu in June 2014, Kuhina in March 2015 and Kaheha in June 2015. Those losses would have left the group with only 14 active baskers, less than the number that were gracing Laniakea with their presence 10 years before. Fortunately, 2015 also began a resurgence in new baskers. That year 4 new turtles, all sub-adults or juveniles, began coming ashore between March and June. JP, named for Joanne Pettigrew, the founder of Malama na Honu, first appeared in March, Hilahila in April, Kaimana in May and Kaipua in June. Two years later in 2017, Makana (juv) joined the group and Maka Nui (juv), Big Eyes in English for its demeanor when it first appeared on the beach, began hauling out at Laniakea in August 2018. As of the beginning of 2019, there are 20 turtles actively basking at Laniakea, 5 adult males, 8 adult females, 5 sub-adults and 2 juveniles. 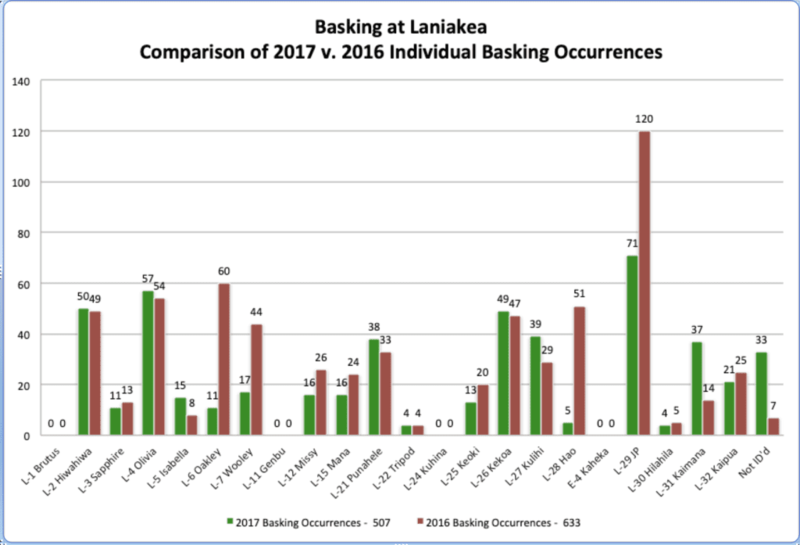 Overall basking totals for 2018 for the Honu `Ohana were the highest since 2014, the last year our champion basker Brutus was still in residence.